Leeds United Red Bulls or could Elland Road become the Red Bull Arena? The Yorkshire Evening Post is reporting that Leeds United are in talks with Red Bull over a stadium naming rights deal. Reporter Paul Robinson’s exclusive suggests that meetings have already been held between the two parties, which may also involve shirt-sponsorship. If a deal did go ahead, it would seem likely that there would be talk of stadium naming rights as historically the firm has taken a high profile approach to its sponsorships. It already has the New York Red Bulls, FC Red Bull Salzburg, RB Leipzig (nicknamed Die roten Bullen), Red Bull Brasil and Red Bull Ghana. They also sponsor Fiorentina’s Mario Gomez and Austria’s captain, Marc Janko. 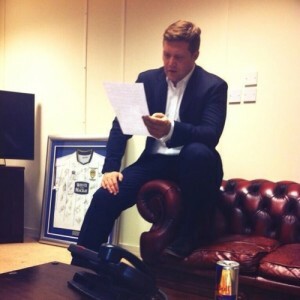 There have been rumours on Leeds fan-sites for some time about the tie-in, mainly due to a rather prominent can of Red Bull on managing director, David Haigh’s, Twitter picture. He also very recently followed a number of Red Bull accounts.